Have you ever peered inside your refrigerator, taken stock of all the easily visible items and thought, what am I gonna do with that? What did I buy that for? Allow me to introduce you to flaxseed meal. It’s not something you eat out of the container, and it’s not an ingredient that makes dishes memorable. It is, however, a healthy addition to many foods, and a great mix-in with your morning yogurt (which is exactly how I used it when I made breakfast this morning). Hi! I'm good for you! What is it? 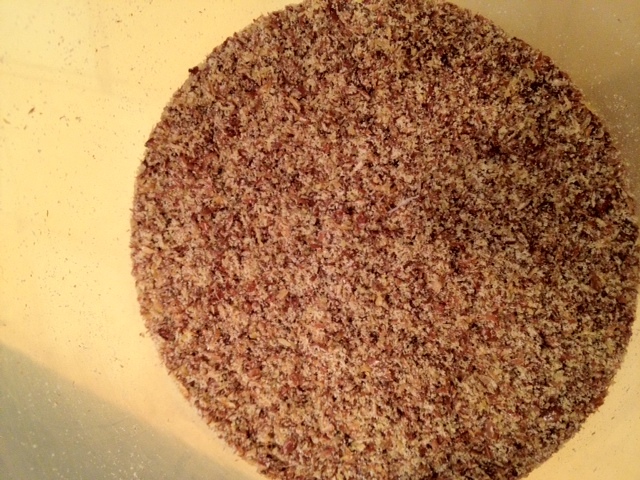 the result of grinding flaxseeds (brown or golden varieties). You can buy it ground, or buy the seeds and grind them yourself in a coffee grinder. What’s the big deal? Flaxseed meal is a nutritional powerhouse–it’s full of the good fats and lots of fiber, and while I’m no nutritionist, that stuff is supposed to be good for you. Where do I find it? Mostly anywhere, and in large supermarkets it’s usually found near the cereals or special diets section. I get mine at Trader Joe’s, which has their own brand, or if not they usually carry this (my preference). Where do I keep it? 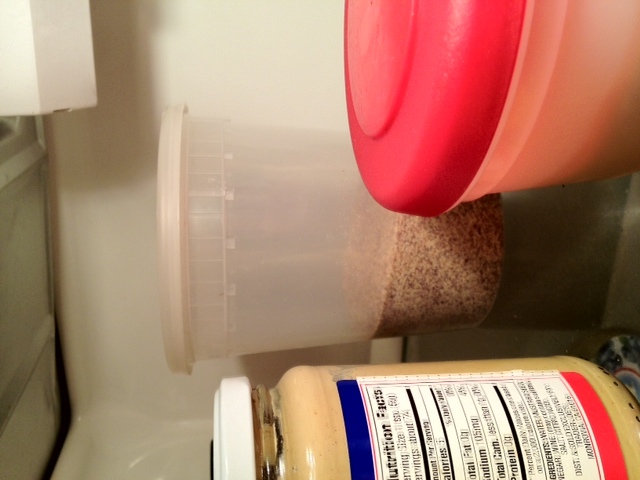 In the fridge, in a sealed air-tight container, where it will keep indefinitely and retain it’s nutritional value. *Sometimes flaxseed meal is called for in recipes, but when it’s not, proceed with caution when you bake. Baking is chemistry, and if you alter the chemistry of a baking recipe, you might ruin it. Or you may just have a happy accident. 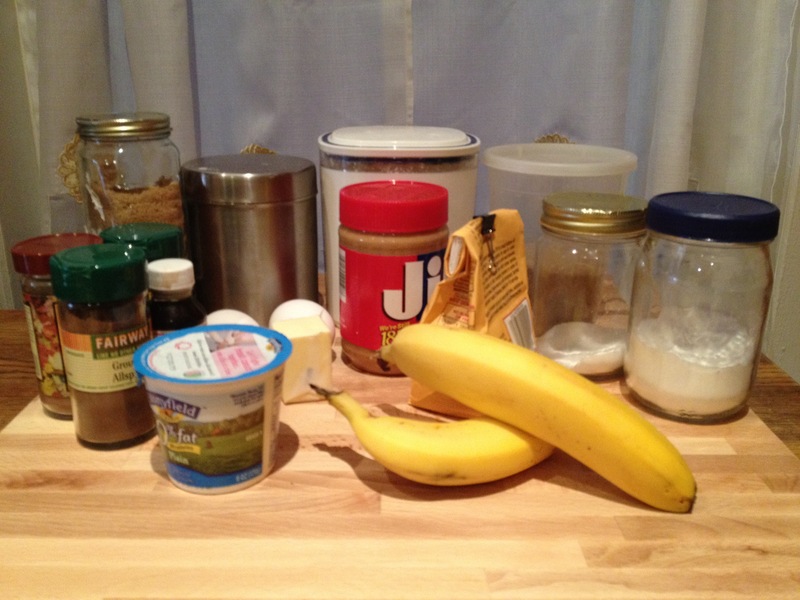 ***Updated @ 9:20pm: I found a recipe for Banana Bread that uses flaxseed meal (which is extra awesome since I’m stuck with a basket of ripe bananas). I’ve still got some customizing to do, but in the meantime here’s a preview of the ingredients. Recipe to follow this weekend. This entry was posted in Musings, Tips and tagged baking with, cooking with, fat, fiber, flax, flaxseed meal, nutrition, nutty. Bookmark the permalink. Someone necessarily lend a hand to make significantly posts I would state. This is the first time I frequented your web page and thus far? I amazed with the research you made to make this actual submit extraordinary. Great activity!